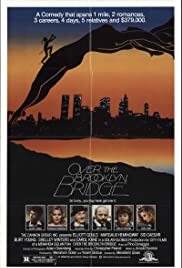 OVER THE BROOKLYN BRIDGE is probably not well recalled by most people today, but the film is only twenty two years old, and certainly captured a spirit that is rarely seen in American films. For all the so call liberalism of the American cinema, certain aspects of ethnicity are quietly buried. Anti - Semitism was attacked in GENTLEMAN'S AGREEMENT, but the anti-Semitism under scrutiny was a social form (you can't join certain clubs, you can't get certain jobs, you can't register in certain four - star hotels) which is annoying but somewhat bearable compared to European or Middle Eastern versions. Except for one notorious incident (the Leo Frank trial, and lynching) in Georgia in 1915, it is rare that the degree of anti-Semitism in this country has gotten so hot as to make Jews literally fear for their lives. In the case of the Frank affair, the Anti-Defimation League of B'Nai Brith was created. But that was the real highpoint of rabid anti-Semitism going so far. One of the misguided ways that Hollywood has acted to reduce the tension is to ignore or make fun of it or concentrate on other side issues. So if we see Jewish lives at home, it is done in a funny manner. For example: in MY FAVORITE YEAR Alan Swann the famous movie star is invited to a Jewish home for dinner, and he is well treated, but the family act like a bunch of clumsy oafs in their reactions to the polished (if drunken) Swann. Most of the time Jews don't act so stupidly, but not in Hollywood comedies. OVER THE BROOKLYN BRIDGE tried to mingle the comic with the dramatic in a study of religious bigotry and financial muscle. Alby Sherman (Elliot Gould) is a coffee shop owner in Brooklyn who has been saving his money and planning to buy a fancy eatery on the east side of Manhattan. To do this he is dependent on the good will of his Uncle Benjamin (Sid Caesar), who has made a good living in the clothing trade. Benjamin is very fond of Alby, looking at him as the son he always wanted (Benjamin has a wife and son, but the son is a smirking non-entity, and certainly not one to have a wife and children). However, Benjamin is very conscious of being Jewish, and he wants Alby to marry a Jewish girl. Alby is currently shacked up with Elizabeth (Margaux Hemingway), who is a "shiksa" (a non-Jewish woman). Ben is not happy about this, and basically lets Alby know that if he wishes to get financial assistance from his uncle he has to drop Elizabeth. To his credit Alby does not do so - he tries to find alternatives to going to Ben (even toying with a loan shark). Ben, in the meantime, presumes to meddle further by confronting Elizabeth and asking if she really wants to hurt Alby or sacrifice their love to enable him to succeed. Ben, of course, does not see his meddling in a bad light. He even has a replacement for Elizabeth in mind - Alby's distant cousin Cheryl (Carol Kane), a schoolteacher who lives with her elderly father, and appears to be demure and quiet. The film follows the twists and turns of our hero and his family and Elizabeth. We see a world that Jews are fully aware of, where members of families know each other's business whether they should or not, and where diplomatic maneuvering is as vital on a small scale as the same maneuvers would be between nation states. The film had many funny moments. One I cherish is meek little Cheryl finally cutting loose with the wrong person. Another is when Alby is desperate enough to make a late night phone call from Time Square, turn down the silent request of a derelict for some change, and get a commentary on his generosity he never expected. But to me the most interesting part is watching Sid Caesar's performance. Usually playing comic roles, such as in THE BUSY BODY or in Mel Brooks' SILENT MOVIE, Caesar has always showed how to exaggerate successfully for a laugh. Only he would introduce a drunken woman to a dummy as his friend Matthias Kreplach, the millionaire, in THE BUSY BODY. But here, despite some mild comic touches (his dealing with the Japanese businessmen) most of his performance is serious. In fact, OVER THE BROOKLYN BRIDGE was Caesar's best straight performance in a motion picture. The scene when he finally collapses and explains why he relied on Alby towards the end of the film was a small marvel, as he literally collapses in tears admitting to decades of personal disappointments. Aside from that the performance of Margaux Hemingway haunts me a little. Made less than a decade after her first film (LIPSTICK) she should have been having a first rate career. In many ways OVER THE BROOKLYN BRIDGE represented the highpoint of her career, as most of the other titles were far more obscure. She seemed to have the world open to her in 1984, and few could tell that it would be over so badly in twelve years. For her, the glimpse into Jewish life and real problems, and for Sid Caesar's best dramatic work, I give OVER THE BROOKLYN BRIDGE a "10".